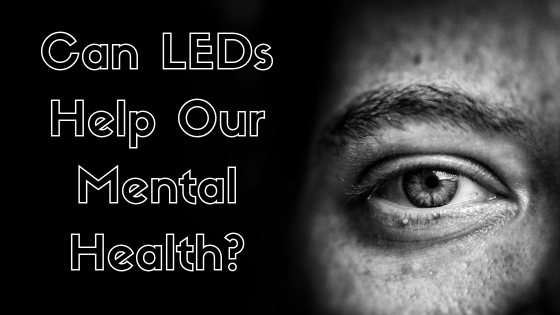 Can LEDs Help Our Mental Health? Light is the very thing that guides us room to room, place to place, day to day. It not only helps us move through the world but also has a deep impact on our mental health and well-being. Today, most of us spend the better part of daylight in offices sitting under fluorescent lighting. Then we spend our night inside at home under incandescent bulbs watching TV or scrolling through our phones. Traditional lighting may, in fact, be hurting our mental state, and today we are going to learn more about how switching to LEDs may help us change our state of mind! So many deciding factors dealing with LEDs revolve around numbers: wattage used, wattage saved, lumen output, money savings, lifespan years, etc… What about the benefits that aren’t so numerical? Recent research from LightingEurope has found that LEDs also offer a wide range of health benefits. Spending your day under lighting mimicking daylight is not only great for your waking mood but also your sleep cycle. Getting enough sleep is essential to living a happy, healthy life, and, surprisingly, bright LED lights can help with that! Investing in LED lighting with dimmers is a great way to practice your own form of human-centric lighting. When you wake up in the morning, don’t turn on harsh, bright white light, but rather soft, gentle light while your eyes and mind adjust. The same can be said before going to bed. These lighting tactics signal your brain to start producing melatonin to help you fall asleep or to wake you up gently in the morning. SAD or seasonal affective disorder, is a common mental ailment people suffer from in the fall and winter when daylight is scarce. Studies have proven the benefits of working and living under LED lighting to help combat feelings of depression in people who suffer from SAD. Invest in LEDs and you are investing in your health and happiness! You can call (319) 653-2123 to set up a walk-through or request a quote online!